Chicago Food Machinery #10 Stainless Steel Meat Grinder with Exterior Polish Finish easily attaches to any countertop surfaces for your covenant use anywhere. It comes equipped with an 8mm plate and easily dissembles for an easy cleanup. 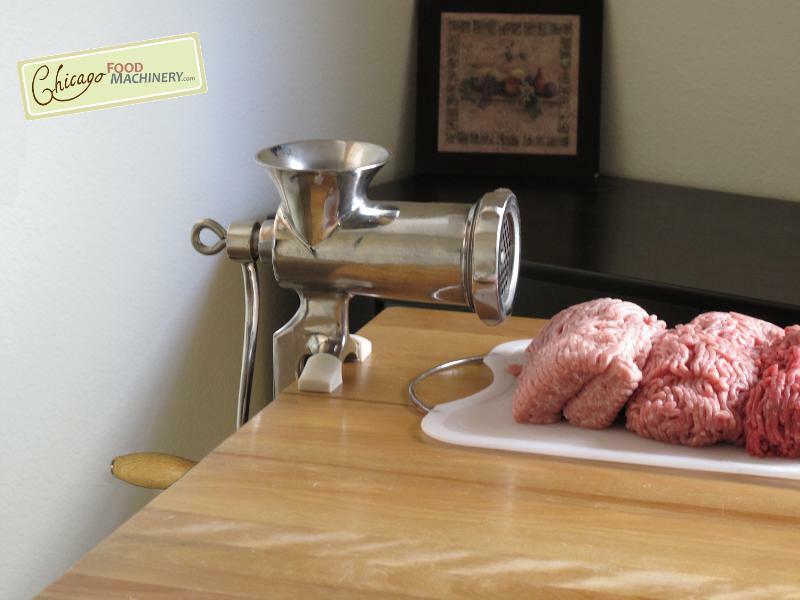 Chicago Food Machinery #10 Stainless Steel Meat Grinder comes with a 1-year Limited Manufacturer Warranty. Each of the Chicago Food Machinery brand stainless steel meat grinders with exterior polish finish are created with the metal casting process called "sand casting." Frequently preferred over mold casting, sand casting offers a better final product not only in appearance (less "seams") but also in durability. Sand cast stainless steel products, like the Chicago Food Machinery manual meat grinders, are better able to withstand the rigors of shipping, frequent use, and offer an easier cleaning experience than cheaply manufactured competitors on the market today Click to View Grinder Interior.